See another side to Tokyo when the city comes alive after dark - we promise it’s alive and kicking 24 hours a day! To experience the city’s nocturnal alter ego, head out with a local to the traditional drinking houses known as izakaya to have a few drinks and share the tasty small plates like yakitori, karaage, gyoza and dozens more are the perfect accompaniment to a beer. Check out the unique standing bars called tachinomiya, sing your heart out in a karaoke bar and go shopping at 3am, then to truly end the night (or start the morning!) like a local, join the queues for a 5am bowl of ramen before the public transport starts running again! 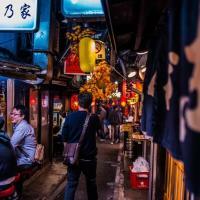 This experience will be personalised to your preferences but you could spend the night bar crawling through Golden Gai, an area in Shinjuku lined with narrow alleyways and packed with tiny, slightly ramshackle but buzzing bars. Hop from a tiny bar in Golden Gai to an izakaya or a tachinomiya, the standing street front bars that are synonymous with Japan’s nightlife and order some yakitori (grilled chicken skewers), a classic accompaniment to a night out in Tokyo and experience how Tokyoietes socialise with friends and colleauges! 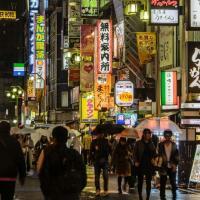 Walk around the vibrantly lit streets of the infamous Kabukicho, the red-light district of Tokyo, where you can buy girls on an iPad, watch girls in provocative outifts ride huge robots or spend the night in a love hotel. Then make your way to explore some of the historic alleyways that are steeped in tradition and dotted all over the city, where you’ll find more character than you thought could ever be squeezed in to such narrow streets! You might want to experience shamelessly singing your favourite songs at a karaoke joint at 3am or go shopping instead. End your night (or begin your morning!) like the locals do with a steaming bowl of ramen at 5am, or try another local staple at one of the many eateries which are open 24 hours a day. Get to know your Local Host, who can give you insider tips and ideas for how to experience the best of Tokyo by night, and recommend other yokocho, bars and eateries to visit during the rest of your stay in the city. Please be aware that most bars, izakaya and restaurants have cover charges (or seat charges as the Japanese refer to) that range anything from 500-3000 yen. Also it is important to be aware that public tranpsort stops running after midnight so you might need to take a taxi back to your accommodation. 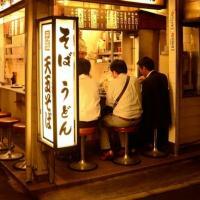 Have a night out in Tokyo with a local! Bar hop through the tiny, ramshackle bars in Golden Gai or enjoy a more relaxed drink at a couple of izakaya and tachinomiya just like the locals do. We did 4 different tours in Tokyo. "Tokyo's nocturnal playground", and "Eat and drink like a local"; this two where probably the highlights of our trip; both host, Kenji and Sergio; they are fun, knowledge and very helpful. I will definitely recommend this company; we change few times the days and book last minute and they were super accommodating, so if you don't know Japan you definitely need somebody like them! I had a great evening tour with Yuji, exploring areas of Tokyo off the traditional tourist route that were vibrant and lots of fun, mixing with locals. Communication was easy and I highly recommend touring with Yuji to gain insight into the culture and local haunts. I had a couple of days to explore Tokyo after a conference and after doing the tourist sites my business partner and I wanted to get under the skin of the city. Our guide Daniela was awesome! She is half Italian half Japanase so she has the best insights and can explain cultural nuances really well. She took us to have some great food we wouldn't have ordered ourselves and we then went to a very surprising area which has like 200 tiny bars that look like they have been there, unchanged for a centennial! It was the most surreal and awesome experience and we met some very friendly locals who did their best to talk to us! We had the best time!